Never growing up. Not EVER! I am fairly certain I’m just a kid trapped in a 32 year old’s body. It’s sad, but true. Well, sad for the poor kid strutting around in an increasingly weight-gaining, back-aching, joint-creaking body. But that’s a whole other post. All the really cool things that got my little heart fluttering with excitement back then, still hold all the magic for me. There are WAY more cool things out there now, then when I was a kid though. In my day we played with sticks and rocks and we liked it! Thankfully I am married to a man who also suffers from the Peter Pan Syndrome. This post was inspired by a gift he recently gave me. This gorgeous and super fun book is all mine! There is nothing about it I don’t love. Unless you count that fact that it’s too short. Books are always too short. Let’s get this out of the way early. 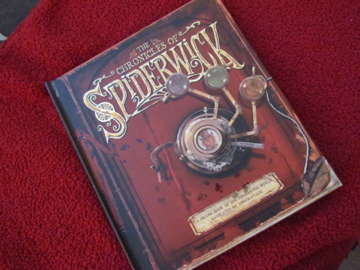 I haven’t actually read the Spiderwick series. I saw the movie, which I’m willing to bet wasn’t nearly as interesting as the books. (Are movies ever as good? Maybe a few.) But you see, that doesn’t even matter to me. 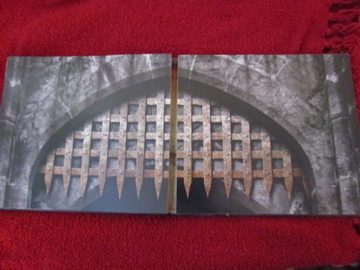 What I love about this book is all the really cool stuff inside. 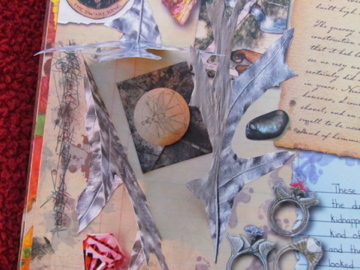 There are maps to pull out, secret flaps to lift and hidden notes to read. The colourful pictures and the creative way it’s all jumbled together is more than enough to stimulate even the most adult-like mind. Soon I shall be a mistress of the wand! This isn’t the only book I’ve come across lately that makes me want to squee! 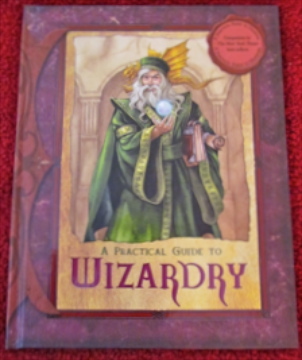 I also purchased A Practical Guide to Wizardry, because you just never know when that will come in handy. Heaven forbid I am thrown into a situation where I must wield a wand or cast a spell, then where would I be? I also purchased a book on weapons which has all the cool stuff like Spiderwick. 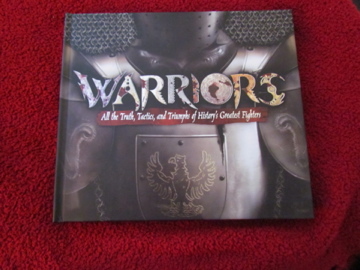 I call this research for my new WIP – a fantasy novel with epic battles and…errr…stuff to be determined. Okay I realize this post has been overloaded with pictures – I apologize profusely – but I’m a visual person and pictures make me happy! a) Be able to draw like Jess. b) Be as cool and free-spirited as Leslie. c) Have a rope to swing across the creek to Terabithia. d) Have a creek near my house in which to swing said rope. I also wanted to be a spy for a short period of time. I can’t even recall the book that inspired me to creep around my grandparents house, spying on all their neighbours through the windows. Plus, they had a back lane where the older kids lingered…SCORE! But I digress. 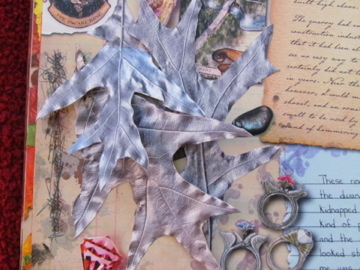 If Bridge to Terabithia had a pop-up-find-the-secrets book, I would have gone insane with excitement. I would still go insane now! Right after I built my fort and read it, oh I don’t know, a million times! Read until insanity hits – that’s my plan. A new Unresolution for 2012 has just formed: No longer will I let the shackles of adulthood keep me from buying all the really cool children’s books I want. This year I will give into my inner child and have some fun! Hell, I might even build me that fort – once the snow melts of course. What makes your inner child go SQUEE!? Space battles. Basically, anything with a laser in it. Thanks for the fun post Angie. I was wondering, have you ever given writing for children a go? Hi Diane, glad you enjoyed the post. I haven't but perhaps it's something to keep in mind for the future. Thanks for the book recommendations LupusAnthropos! I'll make sure to check them out. Likin' your blog – content and especially layout! (I'm a newbie blogger, so layout is always catching my attention these days…) I think I found you on Twitter with WIP500, but I'm signed up for your blog now too! Thanks for some happiness. Dasia – The Craft is SO good! I think I need to watch that movie again real soon. You're right though, life is too short to ignore your instincts. My instincts say 'more books for all!' Thanks for the comment :)Hi Janie, thanks for the comment! I'm so glad you stopped by and signed up. You just made my day! I've changed my blog too many times to count, but I'm digging this new layout. If you have any questions just tweet me. Always willing to lend a hand to a fellow blogger/writer. Hmmm….snowy days even though I hate the cold. (My body literally can't take the cold…makes me miserable!). But I love the thought of "No school! Snow day!" Even though it's no work now. :)My own stepdaughter. She finds joy in the simplest things – she's almost 8 and still prefers building forts with sofa cushions over her MP3 player, a self-inflatable whooppee cushion over her Android tablet, and lots of paper and tape over her DS3. My inner child goes SQUEE!!! over all of the following:* books with beautifully hand-drawn pictures* the opening chapter of the first Boxcar Children book* cardboard boxes, jumprope, bedsheets and crayons (used all together, they're amazing)* the movie The Neverending Story. I don't care how dated that movie is — I love it; and Bastian (the boy reading the book) is what makes the movie for me – always has. I have a plethora of children's books with gorgeous illustrations. Kept them from childhood, read them to my kids and keep them for future grandkids… I loved the 'Mary' books by Marcel Marlier, and the illustrations by Janet and Anne Johnstone…they still make me go gooey, I'm an old romantic!I also loved 'Bridge to Terabithia' and wanted a rope swing! My inner child emerges, or rather escapes, when there are trees to climb or rocks to clamber across…I may be forty, but I can still climb a tree! Nothing should ever diminish our childhood joy…we may mature, but 'grow up'? Never! Thanks for all the comments everyone! Sounds like you are all taking great care of your inner child. Thanks Lisa for following!Angela, I have another book that has beautiful pictures called "The Day I Swapped my Dad for two Goldfish" by Neil Gaiman. You've probably heard of it. Love it! Ooooh, those books are amazing! And I definitely think you should give your inner child free rein. DO IT. :)I'm also planning to read more kids' books this year, and I dress up as a pirate or a Harry Potter character with surprising frequency. I've got it covered! I may have an addiction to comic books but so far it's just a rumor. 😉 You get your fix on any sort of genre you like because ultimately books are cool no matter what. Now I need to get back and see what Archie is up to, I mean go read War and Peace. Zencherry – You are awesome! How's Archie? Thanks for the comment!J. Whitworth – I'm glad I'm not the only one who owns it 🙂 It might have been Harriet, I really can't remember. Thanks for commenting! Angela's comment reminds me that my dad used to sell mopeds and motorbikes, and they'd be shipped in giant cardboard boxes. As a kid, I had imaginary spaceships and submarines ALL THE TIME. It rocked.